John Lochtefeld, son of Nancy and Tom Lochtefeld, is the recipient of the 2018-2019 Daughters of the American Revolution Good Citizen Award. John Lochtefeld is the recipient of the 2018-2019 Daughters of the American Revolution Good Citizen Award from the Good Wife’s River Chapter of the DAR. An annual presentation of Darien’s Good Wife’s River DAR Chapter, this award is given to a Darien High School senior who best exemplifies the qualities of patriotism, citizenship, dependability and service to community. A leader among his peers at Darien High School, John is a member of the Community Council where he serves as Vice President of the student body and is also a member of the Best Buddies Program which fosters relationships between students with intellectual and developmental disabilities and the student body. John is a Connecticut state certified EMT and spends his free time volunteering at Post 53, where he helps to provide emergency care to the community. In his capacity as a member of Darien-EMS Post 53, John serves as senior officer: director for OSHA, which helps to ensure a safe environment, through compliance with OSHA regulations. During the summer of 2018, John served an internship at Mt. Sinai Hospital where he edited and uploaded procedures for an online textbook for his mentor. 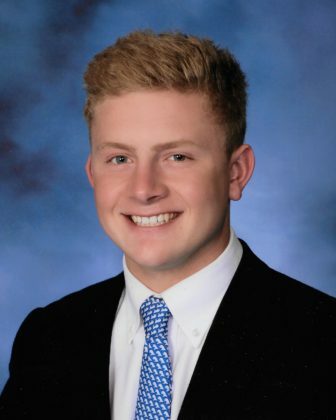 As a senior at Darien High School, John excels academically and was inducted into the National Honor Society, is a member of the Tri-M National Music Honor Society, the National Mandarin Honors Society and the National Science Honors Society. In addition to his challenging coursework, he also competed in the 2017 Connecticut STEM Fair where his interest transformed into a study of telomere length in relation to cancer in human cell lines. A talented musician, John plays all types of the saxophone including alto, tenor, baritone and soprano. As a baritone sax player, he is a member of the Darien High School Honors Wind Ensemble and Concert Band and was also selected as a member of the All-State Western Region Connecticut Wind Ensemble. Athletically, John participated in varsity football as a two-way player, a defensive tackle and an offensive guard, on the Darien teams that won the Connecticut state football championship in 2016 and 2017. He was also elected captain of the varsity tennis team for 2019, and was the recipient of the FCIAC Scholar-Athlete Award in fall of 2018. A member of his local church youth group, John serves in several capacities, including as an acolyte during Sunday services, volunteering at a Somali refugee camp in Maine in 2015, assisting at a senior citizen home in Minnesota during the summer of 2016 and working with a youth camp for over 100 children in Cuba in 2017. His future plans include pursuing his passions and academic interests in college and ultimately, going to medical school to become a pediatric physician. Darien’s Good Wife’s River Chapter Daughters of the American Revolution will tour Darien’s Mather Homestead on Monday, Oct. 15, from 11 a.m. to 12 noon.